When Reșița was first documented in official records in the early 14th century, the village at the foot of the Lupak Mountains used to be a small settlement. In the early 18th century, the village already had 62 houses and 250 inhabitants. After the Ottoman Wars of 1738 and 1739 and the repeated Ottoman raids at the Habsburg borders, the treasury in Vienna decided to bring the smelters and metal factories of Bocşa to a place of greater military safety. 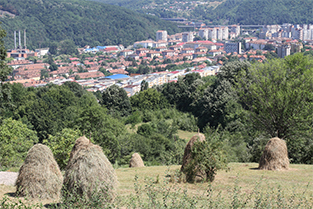 Reșița was chosen for its location and its secure energy and natural resources. In 1769, Maria Theresa issued a “settlement patent” which resulted in the construction of today’s old city of Reșița, in the building of two furnaces, metal processing areas, depots, company housing and a residential area for the workers. In 1771, the two furnaces of Reșița were consecrated by Franciscan monk Gvozdych from Karasevo in Croatia and started running. In the mid-19th century, Reșița saw an economic boom. The state railway, one of the largest industrial firms in middle Europe at the time, moved their headquarters to the Banat Mountains to Reșița. Thus, some technical innovations came to Reșița earlier than to other regions. Hungary’s first steam train was built in Reșița in 1871. But as there were not tracks in the city, the engine had to be transported 60 kilometres to Oravița. The metal producing industries were enlarged and after World War II, Reșița had one of the largest machine building industries of south-eastern Europe. After the communist nationalisation movement of 1947 and 1948, a period of Romanian-Sovjet “joint ventures” began. The factories were later divided into mining factories and machine building industries. After 1989, they fell victim to the rationalisation actions and the transition to the market economy system. Many people lost their jobs, production was limited and some industrial sites were closed completely. Today, Reșița celebrates its city yearly on the day of Saint Peter and Paul. On this day, the importance of the city as a town of steel and iron is commemorated. The steam engine museum of Reșița shows a collection of different types of engines which were produced in Reșița since 1872 in an open-air exhibition. The exhibition displays one of the oldest existing steam engines ever built in Romania and one of the last big steam-driven tractor which was built in Reșița in the early 1960s. 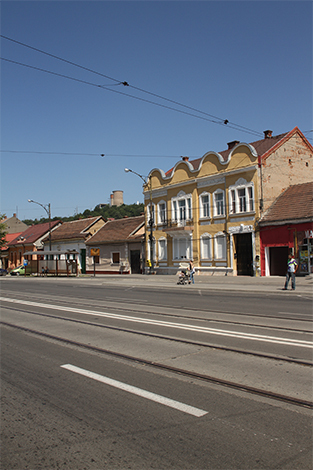 The centre of old Reșița was a site of large demonstrations and meetings in the history of Banat and the Romanian social democrats. Reșița was a “red” city and used to have a representative building of Banat’s social democracy: the workers’ home, a political and cultural centre of the workers’ movement. Today, one can still get a glimpse of the old Reșița with its detached houses and the few single-story houses. Markowski House and its balcony have entered the history books of Reșița. It was this balcony from which the Autonomous Republic of Banat was declared after World War I. “Kiss-ti-Hand-Gassn” (Hand-kiss Alley) in Reșița is a small alley in which many civil servants used to live. It runs parallel to the main street behind the workers’ home (Casa Muncitoreasc). Here, one did not say greetings such as “Good Day”, but said “Kiss-ti-Hand” (Let me kiss you hand), which gave the alley its name. 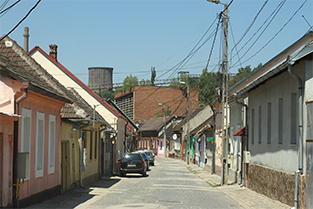 The alley shows a typical street design of old Reșița. The middle part of Reșița viewed from Mount Lupak. Here, the settlement first documented in the 14th century was located.